Okay. You're selling me on secret paladin a little more. Extremely good in secret hunter and in s. paladin. And I'm not even going to talk about the wild decks. Secret Paladin will definitely be a thing after rotation. I like that the minion is a Blood Elf, which was always a connection with secret paladin. The secret synergy is real! 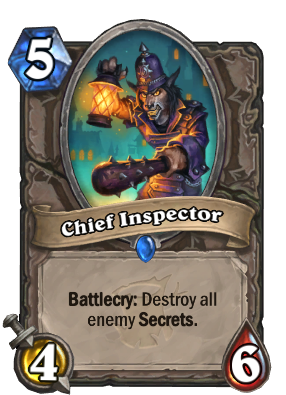 We'd better be getting some sort of counter to secrets. Flavor text: "I'm so slow"
Why do they enforce the return of Christmas tree Paladin? Now give us another Avenge and the game turns into (censored) again. I think it's slightly overhyped. 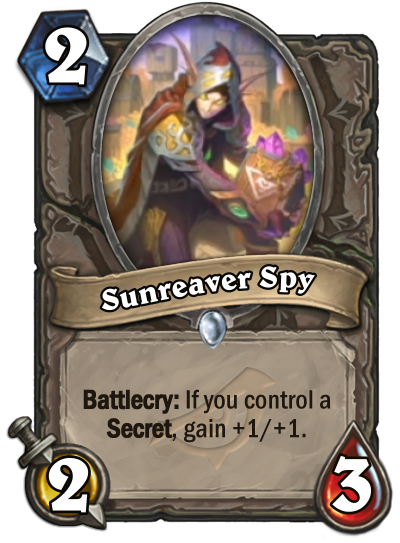 It requires the first turn of an aggro deck to just play a secret, and it can be triggered easily by the other aggro deck (rogue). If they get it off, it's definitely good, but I don't think this is busted. A LITTLE more ? It's time to believe man! This + the legendary + the twinspell secret + existing secret synergy, it's a crazy strong core of tempo cards ! At the time this was revealed, they hadn't shown the weapon yet. I'm sold on the deck now. really powerful card, once the secret list is optimized little will be able to stop it. I'm still not sold. I think this card is very good and likely meta-defining, but what's Secret Pally's refill (in standard I mean, this card will nuts in Wild, btw) with Divine Favor getting HoF'd? Crystology maybe? Are we maybe adding Cult Masters in Secret Pally? I think out of the gate, Secret Pally is your tier 1 aggro list. But as the experimentation dies down and lists become more refined, I think it may fall off. Love the Paladin Fiery War Axe as well. a staple of any secret paladin build. The cost to body is just too good. A natural fit for Paladins; their 1-cost secrets curve right into this. Secret Keeper (other 1 drop) + Coin Secret ? You can also play it turn 3 with a Secret which is still good. Also with the Secret that gives all your minons +2 health this combo is just insane. Secret Pala will be Tier 1 for sure.